DONEGAL TD Deputy Pádraig MacLochlainn is to shadow Tánaiste and Foreign Affairs Minister, Eamon Gilmore after been given the job of Sinn Féin spokesman on Foreign Affairs and Trade. Sinn Féin yesterday announced portfolios for each of its 14 TDs with Deputy Pearse Doherty keeping the Finance role. Party leader, Gerry Adams, will shadow the Taoiseach Enda Kenny while deputy leader Mary Lou McDonald is spokesperson on Public Expenditure and Reform. 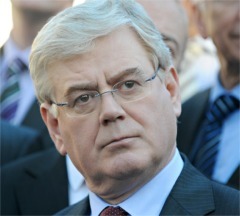 Tánaiste and Foreign Affairs Minister, Eamon Gilmore. Aengus Ó Snodaigh is spokesperson on Social Protection and party whip while Caoimghín Ó Caoláin takes Health and Children.